Assembly of the mount is simple and can be accomplished in less than three minutes. The "Mount" itself is made of hardened co-polymer Delrin, mounts on the rear crossbar of the bicycle. You will need a standard pair of pliers which will enable you to tighten and loosen the wing nut screw used to cinch the bearing post in position. This system allows you to sail your Banner Flag from a stationary ground position. The Bearing post can be inserted into the ground and will allow the Banner Flag to follow the wind. The Bearing post spins with the wind preventing bind up of the Banner Flag. The Bearing Post allows your banner flag to sail any direction the wind is blowing. The Bearing Post spins with the wind preventing bind up. The Bearing Post can be sunk into the ground or used in conjunction with our Bicycle Assembly Mount so you can take your Banner Flag mobile. 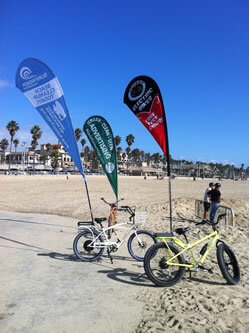 You will need this to fly your Banner Flag at ground level or mobile with our Bicycle	Mount. A crossbar base stand with the water bag weight to add to the bottom of the modular flagpole. By adding this you will be able to use your Banner Flag in a stationary position including indoors. Assembly of the mount is simple and can be accomplished in less than three minutes. The "Mount" itself is made of hardened co-polymer Delrin and mounts on the rear crossbar of the bicycle. This works with the Bearing Post to mobilize your Banner Flag.